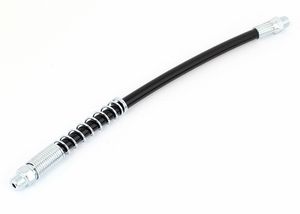 18" Nylon Grease Whip Hose Extension For Manually Operated Grease Guns only. Maximum working pressure: 3,500 psi, 1/8" NPT. Spring Guard to extend the life of the hose assembly. Order with or without optional Grease Coupler. Other lengths are available. Inquire by e-mail.